The Boyds collection of bears changes all the time due to the fact that many new bears are added each year and, many are retired. 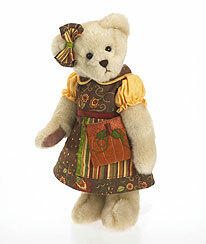 Boyds bears are known for their whimsical appearance, which is part of their charm. I have chosen a few bears from various collections the company currently produce to give you an idea of the sorts of bears that Boyds produce. Although currently available they may not be for long. Boyds like to produce special editions of bears to mark certain celebrations and events to include in the Boyds collection. These bears in themselves can be collected within their own special category, for instance as you will see below, there are several gardening bears which I'm sure will be added to over the years. Produced to celebrate Americas Fourth of July. Glorianna is a 12" bear dressed in blue pants with star button accents on her cuffs and a layered red, white and blue shirt. Her outfit is topped off with an oversized red and blue upturned brim hat and a red sparkler. One of a number of bears to celebrate the spring and summer seasons. 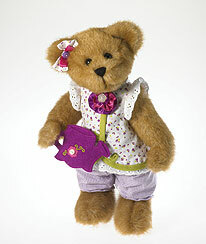 This lovely golden bear is 12-inches in height and carries her own watering can. She is dressed in a bright floral print overcoat with green piping and purple and white lilac check pants. 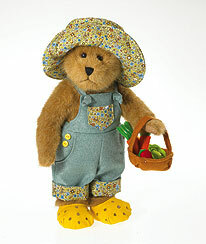 A teddy bear vegetable grower this time to celebrate the summer months. She is dressed for gardening in this cute pale blue overall with a miniature floral print on her leg bands and pocket. She has a matching hat and yellow croc-like shoes. I love the little basket of vegetables that she is carrying too, a lovely touch. This limited edition bear come from the company's Williamsburg collection. 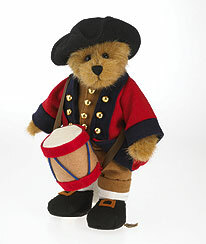 A 10" bear dressed in a traditional military musician uniform of a camel-cuffed britches, vest, gold buttons and red and blue waistcoat. He comes complete with a matching hat, shoes and drum. These collections are grouped within certain family names; I have chosen two of the families to highlight here. Again if you are looking to collect just a certain type of Boyds bear, choosing the families range is a good option as there is so much to choose from. As you can see this family is based on the fashion of patchwork. The detail in this costume is simply divine, she has faux mink plush which shimmers against the patchwork dress which features polka-dots, striped and floral and vine patterned fabrics in the patchwork. Ella comes with a rust corduroy quilted purse which has pumpkin stem and vine embroidery as well as a small fabric patch. As the name suggest this family is inspired by roses and a traditional English style. 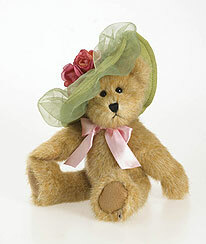 This bear wears a lovely felt and pink hat with a floral accent. Simple yet very stylish, don't you just love the hat? As the name suggests the Boyds collection includes new bears to represent and welcome in the months of the year, another great way to hone your Boyd collection. Here are just a few of my favourites. 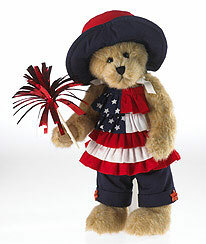 To celebrate the month of July, this teddy bear celebrates Americas Fourth of July in a truly patriot way. 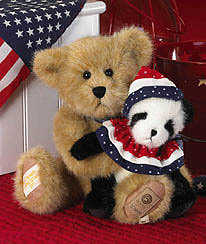 Frankie is a 10" light gold bear, wearing a navy blue satin neck bow; He is carrying Ben who is a 6-inch panda who is wearing a red white and blue cap and ruffled collar. This bear is all about the cold wintery month of January. 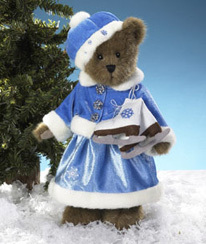 This bear is dressed in shimmering blue velour, white faux fur trimmed dress and jacket. She is already to go ice skating with her felt figure skates. And now for Augusts Summer bear. 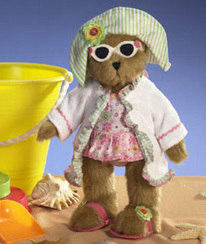 As you can see this bear is all ready to go to the beach with her sunglasses and bathing suit. There are lots of lovely embroidered details all over this costume including little flowers on her sandals. There simply is no other bear as stylish as The Boyds Collection bears.